As I mentioned last time, the Pythagorean Theorem is a difficult concept to have students discover intuitively. So we’re focusing on it specifically this week. If you have any activities or ideas, please let me know. Or tweet it to me. Here’s one sent in by Kevin. The colored ink costs $3 per square centimeter. Outlining in black is free if the color costs $150 or more. If the color is less than $150, then black outlining costs 50 cents per cm. Tara wants those squares to form a right triangle like above, where the vertical leg is 5 cm long, and the horizontal leg is 7 cm long. How much will the tattoo cost Tara? Make sure to write out all of your calculations. The tattoo artist suggests that to save money, and to make the calculation of cost easier, she make the vertical leg 3 cm, and the horizontal leg 4 cm. How much will this tattoo cost, and why did the artist say it would be easier to calculate? Tara asks vertical leg to be 2 cm, and the horizontal leg to be 3 cm. How much will this tattoo cost (to the nearest half-penny, please)? The letters are free. The idea with the first two parts is to get students to see a relationship between the blue and red squares, and the yellow square. I anticipate that students will solve the first part by measuring C, so many groups will get slightly different answers. This provides a set-up for part 2. Both tattoos 1 and 2 should have the outlining done for free. The last part is meant to have students determine the length of C, and it creates a need to know that value precisely…which should get to the need for an equation? I think the use of graph paper is in order for Parts 1 and 2. It makes measuring and drawing right angles so much easier. And shoot, you can count the number of square cm in the smaller shaded regions. I’m wondering if it’s better or worse to construct a right triangle with exclusively whole numbers. Any ideas? 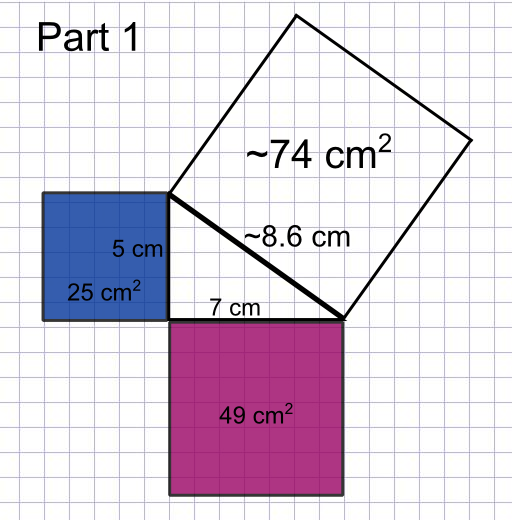 I also wonder if there should be a few more measuring tasks: it’s pretty much the only hope of students discovering the Pythagorean Theorem “on their own”, noting the sum of the areas of the smaller squares equal that of the larger square. Should the pricing aspect of the problem be included in Part 1? It may be distracting, but it certainly adds to the authenticity. What do you think? Please leave any comments you may have in the… comments. 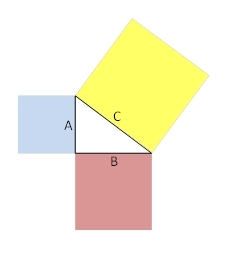 More on the Pythagorean Theorem coming tomorrow. Stay tuned. I love the tattoo concept. I like the graphic and I like the problem a lot! Is this supposed to be an introduction to the Pythagorean Theorem centered around this problem? If so, I wonder if Part 2 gets to the “Pythagorean Triple” a little too quickly. Pythagorean triples are great, and I always encouraged both memorization of a set, the fact that those sets can be scaled, and the generation set (2n, n^2 -1, n^2 + 1), but I worry that working them early on in understanding the theorem gets gimmicky and by gimmicky I mean there are tons of kids that think understanding math means getting to the answer that doesn’t have decimals, being told they were right, and never really understanding. I know problems 1 and 3 deal with non-whole #’s. Matt, I think your alternative to Part 2 is viable, depending upon the students. As a facilitator, I might have “Part 2” written on index cards, and give them that part as they finish part 1. Maybe if there were 2 different versions of Part 2 – one with the prompt for the 3.4,5 triangle, and another as you suggest – so that I could give your version to those kids who are really needing the challenge. 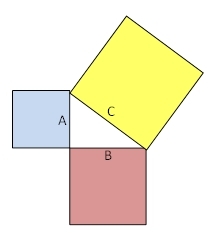 In general, I’m not too afraid of the pythagorean triples, because they make for easier pattern recognition that the area of blue square + area of red square = area of yellow square. And as a math teacher, pattern recognition is my friend. That said, NOT using triples could be a great exercise in the showing them that measurement will never be exact. In general, I anticipate the need for Socratic questioning between parts, to get them to think about the relationship between squares. Nice! I like it. I’m trying to think of ways to rucrrustete my approach to teaching Formal Geometry in High School. My question is this: Is this discovery an appropriate activity for HS students who may have never been asked to think this way? I don;t want to be a nay sayer because i would love to present this to my high school students but I’m afraid of how long the students will stay engaged before they just say WTF!Those are awesome thoughts!I’m going to think of to structure this so students stay engaged! I got my 47th propisition tattoo about a month ago, it was my first. Then read this article today, 444/ 150, 25 is evenly divisable by 5 while 74 is only by 37 and 2, which is no help/ and 82.30. But please Kevin where did you find the beautifully freckled redheaded islander with the brain in the picture above, lets call her Tara, so I can marry her? p.s. without math nerds like the pythagoreans there would be no music, egghead, and how uncool would that be?